Fence Workshop™ supplies aluminum fencing all over the metro Atlanta area. Fence Workshop™ of Atlanta, GA is a distributor of Ameristar and other types of aluminum fencing in Atlanta, Georgia. Our fences are beautiful, functional and built to last a lifetime. An aluminum fence adds a beautiful look around your home or office while still adding the security you’re searching for. Aluminum fencing is a great option for both our commercial and residential customers. We service all neighborhoods of Atlanta, as well as surrounding suburbs. Aluminum fences are so versatile and can fill any of your fencing needs throughout Atlanta. From a beautiful fence around your business in Midtown or something to spruce up your home in Sandy Springs, we’ve got the perfect solution for you. Why choose Fence Workshop™ for aluminum fencing in Atlanta, Georgia? Because aluminum is so rust resistant, our aluminum fences come with a best in class manufacturer warranty. 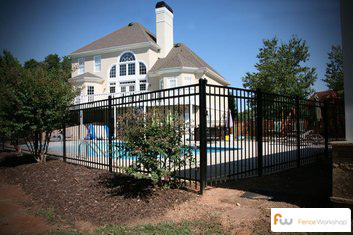 We supply aluminum fences in Atlanta, Georgia and surrounding areas like Dekalb, Decatur, Marietta, Roswell and more.